ERMobile is our mobile app for conference attendees. With both iPhone/iOS and Android versions, this tool is ready to thrill exhibitors and attendees alike. Giving you the ability to swap personal information instantly as well as access user itineraries and trade show floor maps, this customizable app gives you an all access pass at the touch of a button. Let your attendees and exhibitors make your conference their most profitable one yet. Give your conference attendees and exhibitors the power of your conference in their hands. 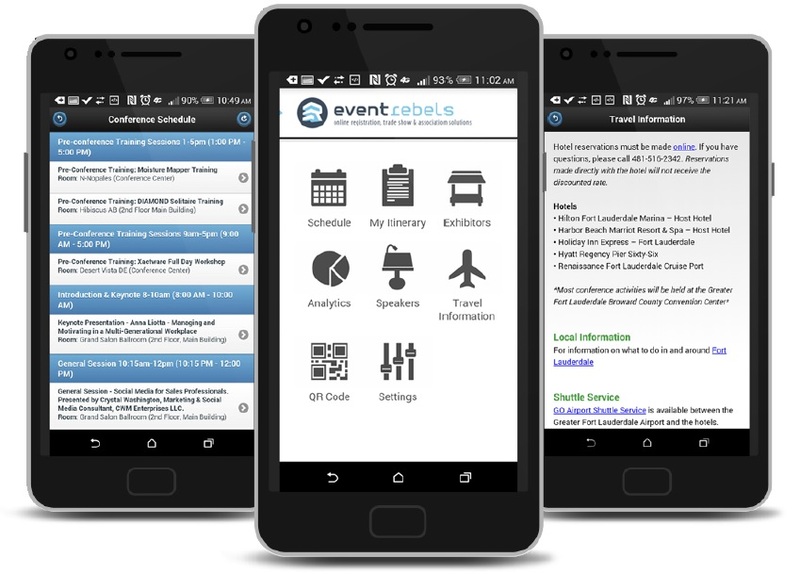 Event Rebels’ ERMobile is a mobile app for conference attendees designed to enhance any trade show, event, or conference. The rest of our products are geared toward event planners and exhibitors, ERMobile does something different. This trade show mobile app is what your attendees need to navigate your event to their greatest advantage. Our mobile conference application is customizable and can be built to suit YOUR individual needs. This product is so much more than a simple conference schedule app. ERMobile it is an interactive trade show guide in the palm of your hand. Combined with session tracking it has the power to individualize your attendees experience based on the sessions they attend. When considering the benefits of an event or trade show mobile app it is important to remember not only the attendee, but also the exhibitor. With other Event Rebels tools like QR code lead retrieval on their phone, an exhibitor can quickly get the information he or she needs from a potential lead with no time wasted. The Event Rebels line of mobile products promises to save you, and your attendee, time and unnecessary expenses.